Just a note that today marks the first day of the Modern Bee blog tour, and I'm guest posting over at Sew Mama Sew with some fun freebies! 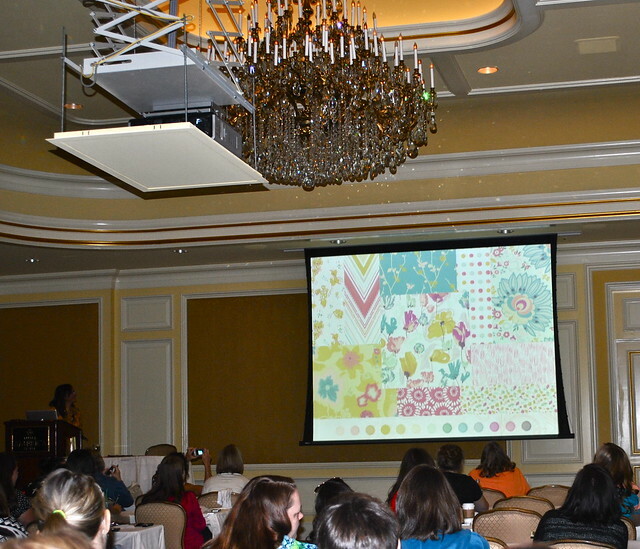 It's time to wrap up my Sewing Summit recap. In case you missed it, you can read part one here! Fabric Design with Pat Bravo was really excellent. I've never considered designing fabric myself, but her lecture really made me appreciate all that goes into a well-designed fabric collection. It also convinced me that I'd really benefit from learning how to use Adobe Illustrator for general graphic design and sewing patterns, so I've added that to my to do list. She also previewed her new collection Rapture, which debuts this November! 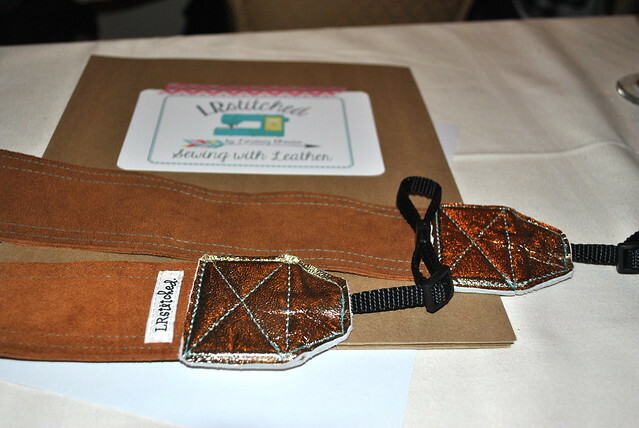 Sewing with Leather with Lindsey Rhodes: Another wonderful and inspiring class. Lindsey is seriously enthusiastic about sewing with leather, which made everyone in the class want to go out and shop for scraps at the nearest Tandy. I loved this metallic lambskin leather camera strap and the other leather accent handbags and totes she passed around the class. Curves Mini Top Quilt with Angela Pingel: This one was fun and not too stressful for me, since I had already sewn curves before. The best part was using the Sizzix die cutter to cut out our pieces and chatting with others while waiting on a machine. I love Angela's version, which she enlarged and stretched onto a canvas for fabric wall art. 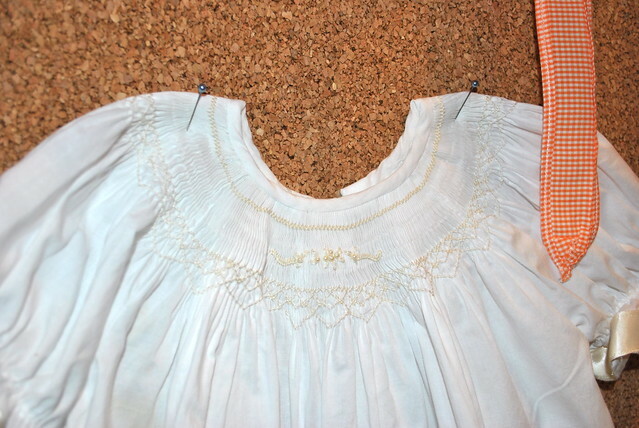 English Smocking with Melissa Mortenson: Wow, this class was a challenge for me! Melissa talked about heirloom sewing, pleating and smocking. Since the sample I sewed in class leaves something to be desired, I'll just show you this pretty christening gown that Melissa brought in as a class sample. The biggest lesson I learned was that stitching by hand takes patience and persistence. Yes, you read that correctly. Friday was so special, I decided to eat two dinners! We started the evening at Bruges Waffles + Fries, where I tried a cone of frites dipped in "fry sauce" (ketchup and mayonnaise... a Salt Lake City staple). The rest of my crew raved about their waffle sundaes with berries, fresh cream and chocolate sauce. Next, we headed to a Favorite Things Dinner hosted by Liz and Elizabeth of Simple Simon and Co. It was hosted at the open-rooftop Garden Restaurant downtown, and I really enjoyed talking blogs, baby names and craft books with the other girls at my table! Check out my red velvet cheesecake and the pretty Salt Lake Temple lit up across the street at night. We all brought one of our favorite things ($5 or less), and exchanged them around the table. It was really fun and I loved meeting these girls! 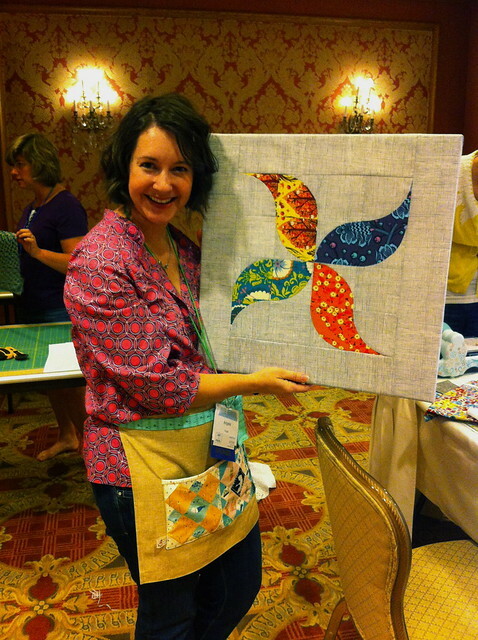 Creative Journey with Colleen Molen: I first met Colleen through Flickr and an online quilting bee, and this class was a chance to get to know a little bit more of her story. This was absolutely one of my favorite classes, because it was relaxed and we got to kick back and soak in all of Colleen's beautiful work! Being the completely thoughtful person that she is, she gifted everyone in the class with these watercolor sketches, reminding us to be the kind of person we want to see in this world. Social Media with Tauni Everett: I heard Tauni speak at last year's Summit, and she was really knowledgeable about how blogging has changed even in the last several months. I was most impressed by her Pinterest tips (pin vertical images with text overlayed) and helpful advice on Facebook engagement (you have 30 to 60 days for Facebook fans to engage with your page in some way, or else they'll no longer see your updates). 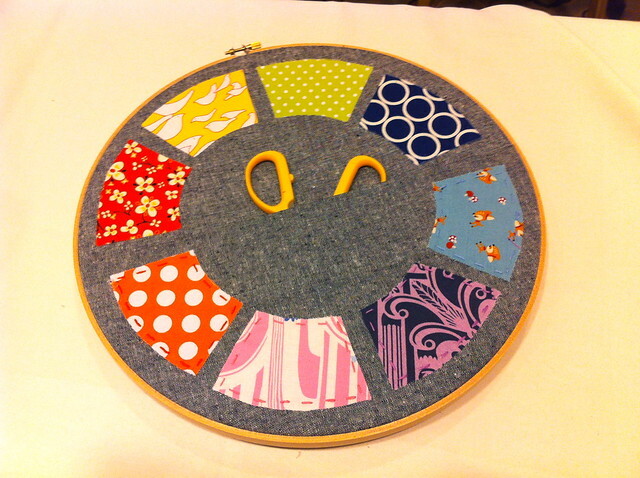 Embroidered Pocket Hoop with Amanda Woodruff: This class was another fun one that I didn't have to think too much about. We used fusible interfacing and hand-stitched rainbow charms to linen fabric to make a cute pocket tote for storing sewing accessories. It's the only project I came close to finishing this weekend, and besides that, looking at it just makes me happy! 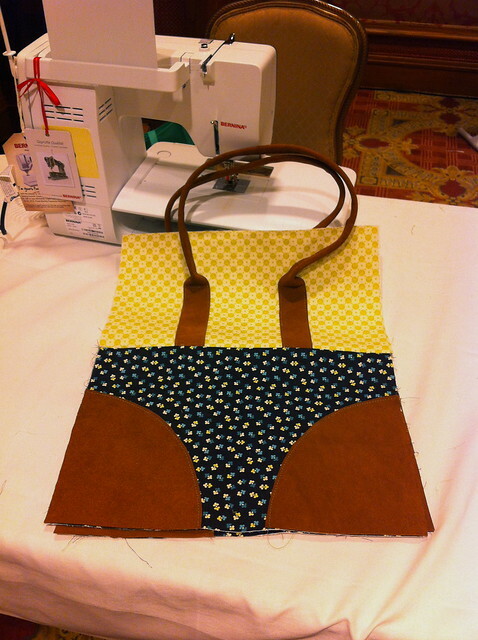 Leather Accent Tote with Lindsey Rhodes: The last class of that day offered a chance to put our leather sewing tips to good use. Working with the leather was a challenge, but I learned some valuable things about adhesive (it gums up the needles) and the needles themselves (you need a leather needle). If you like this tote (you can see Veronica's finished tote here), Lindsey is opening an online shop and will be selling leather kits very soon! Dinner the last night included a keynote speech by Heather Bailey (Instgrammed here). Later Saturday night, we were invited to a mixer hosted by Sukie and the Salt Lake Modern Quilt Guild. 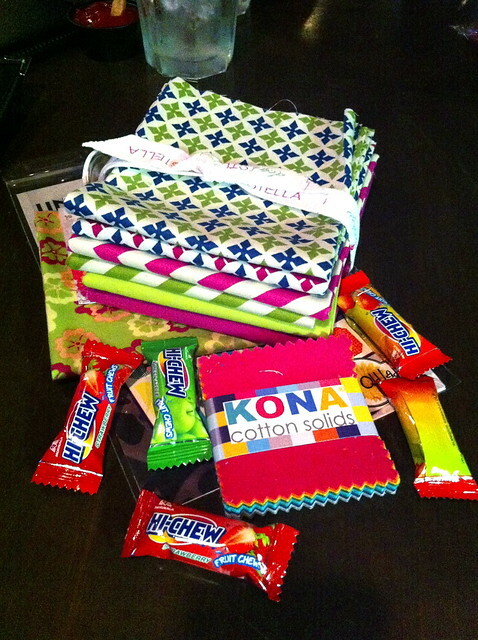 Many thanks to Robert Kaufman, Dear Stella, Crazy Old Ladies and Pat Bravo Design for gifting us with this adorable swag! Hope you all have a great week ahead, with lots of creating! I love it - 1st dinner, 2nd dinner. Reminds me of the The Hobbit and Lord of the Rings, LOL!! What fun! One day I hope to attend one! Thank you for sharing!